"Biblia Koshodo no Jiken Techou 7～Shioriko san to Hatenai Butai” (published February 25, 2017 by ASCII Media Works, Inc). Jay Quintana Jan 06 2018 8:45 pm Who would have thought a show about old books would be so binge-able? 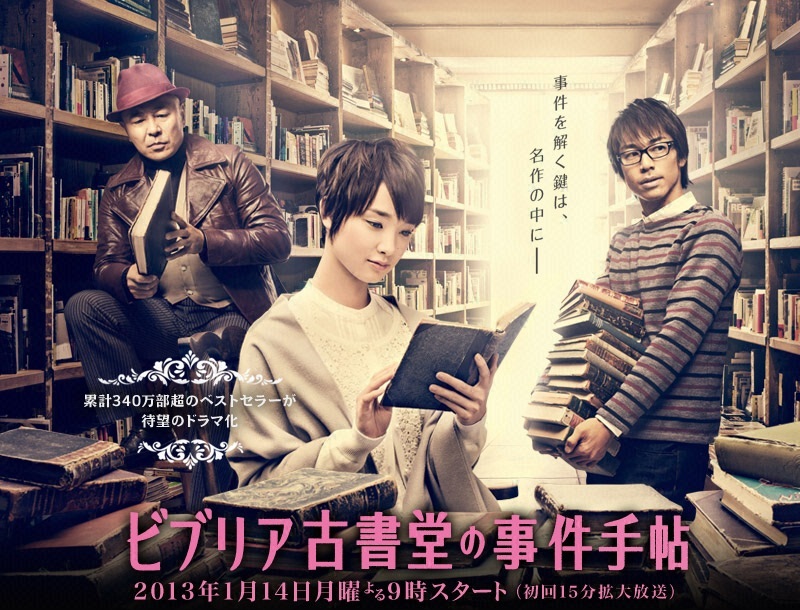 Ace Oct 13 2014 5:41 pm As a bibliophile I applaud this show. I wish they'd have done more. I was sad to see the end of the series. The only thing that I remember seeing Akira in was as his bombastic, exuberant GTO character. But he was really good as the more subdued Daisuke. Ayame as Shioriko was a pretty spot-on fit. But mostly I think in the end it was the script that kept me watching. Shioriko was a really interesting character. Bob Abooey Jan 24 2014 3:43 pm okok, you're wrong about the lead actress not being beautiful. But that's your subjective view just like a painting. One person may find van Gogh's Starry Night childish while another will think it's one of Man's top 5 paintings of all time. I know MANY non-Japanese guys and men who are instantly drawn to Gouriki's beauty. You're right about her not having a generic looking Japanese look and that her look is unique. I read this on another blog here on AsianWiki, and i agree with what that person said saying her look AND presence is similar to Audrey Hepburn for a Japanese actress. as for the drama, imo, it's one of the best Asian dramas i've seen. Each story is written brilliantly. The characters are perfect for their parts. I like the settings, the cuts and editing and that it gives you, the audience, a chance to get involved at what the mystery behind each story's predicament is all about before Gouriki's character explains her theory on the matter. okok May 03 2013 6:33 am The drama is great very informative. Clockwork Orange one of my all time favorite movie and I didnt know that in the book it has different ending, first i didnt think what this drama tell is right but then I search OMG the drama is right and they are right stanley kubrik gets all the credits for this one and burgess didnt. They also mention famous writer like fujiko fujio ( doraemon creator ) and Edogawa Rampo. I even search cheburashuka and it is real. Probably the most informative drama japan has produce. Pawn Stars should hire the her as their books expert LOL. The female lead maybe not be fantastic actress but has this big AURA and huge screen presence, her face is unique not GENERIC JAPANESE FACE which is good. This may sound stupid but I will not be surprised if one day I see him in some international film, hollywood casting directors didnt look for acting talent but their screen presence, BTW screen presence dont mean good looking( and I didnt find this girl beautiful ). Kill bill 3 is in the plan chiaki kuriyama version 2? dead looks? probably. what?? May 02 2013 1:37 am I thought the actress is yu aoi LOL. The drama is different especially in the first episode the part where the main characters says "I love old books, not just because of the story inside, but because as they passed hand to hand....that writes its own story too" THEN a superb music comes the camera fading out books falling from the shelves. Brilliant directing!!! 11bravo Mar 30 2013 10:39 am Quirky series, a lot of fun, and informative. Hope there will be a season 2.